Contact Our Local Experts For Services You Can Trust! Popcorn ceilings have gone through a massive decline in popularity after the look went out of style and we rarely see them in modern designs. They remain, however, in a lot of older homes as homeowners never get a chance to hire a professional to remove the material. If you're ready for a more modern, sleek touch and want to make a difference in the way your interior looks, hire our professionals at Drywall Repair & Remodeling Simi Valley for the job. Our process encompasses several steps so that the final result is flawless, and you're completely satisfied with your ceiling. Firstly, our technicians will remove all light switches and fixtures from the room. Then, your values, including furniture and floors are fully masked so that the residue, dust and debris doesn't end up damaging them. Only after these steps have been done can we start removing the unpainted stucco. Surprisingly, this is perhaps the simplest steps of all as the material is easily dissolved in a water-based solution. However, if you have painted stucco, this will mean we'll have more difficulty removing the ceiling. After the removal, we will fill the substrate, sand the surface and apply the finish coat for a more even, smooth finish. Finally, we're committed to leaving the place cleaner than we found it and will remove all material as well as vacuum and clean the place. Our professionals have completed thousands of successful projects and know what a perfect popcorn ceiling removal job should look like. Each one of our highly-skilled home improvement experts has undergone rigorous training and has the right tools and knowledge to execute the job perfectly. We recognize customer satisfaction is the drive behind every thriving business. Most of our customers are referred to us through the word of mouth and take special pride knowing our advertising is based on this principle. Our service will remain prompt, efficient, and affordable for as long as we remain in business. 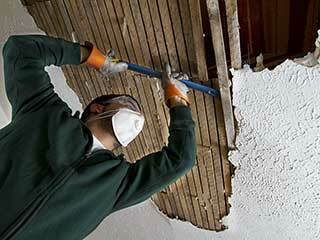 Let us know if you need any help with removing your old popcorn ceiling or have any questions about it!